Everyone knows that homeowners insurance is designed to insure against fires and floods but few are familiar with credit default swaps, arcane financial instruments invented by Wall Street about ten years ago. Credit default swaps (CDS) were designed as “insurance” to reimburse banks and bondholders when companies failed to pay their debts. Credit default swaps have become so popular among banks that the Comptroller of the Currency (OCC), which regulates banks, reports that they are the fastest growing derivatives product in the market, growing 19% from the second quarter to the third quarter last year to $14 trillion in value. It's Time to Dump the Federal Reserve - The credit storm which began in July when two Bear Stearns hedge funds were forced to liquidate, has continued to intensify and roil the markets. Last week the noose tightened around auction-rate securities,a little-known part of the market that requires short-term funding to set rates for long-term municipal bonds. The $330 billion ARS market has dried up overnight pushing up rates as high as 20% on some bonds---a new benchmark for short term debt. Auction-rate securities are now headed for extinction just like the other previously-vital parts of the structured finance paradigm. The $2 trillion market for collateralized debt obligations (CDOs), the multi-trillion dollar mortgage-backed securities market (MBSs) and the $1.3 asset-backed commercial paper (ABCP) market have all shut down draining a small ocean of capital from the financial system and pushing many of the banks and hedge funds closer to default. Although th e-Mini S&P 500 (e-SPH) has given up its early gains, my sense is that the upmove from yesterday's low to this morning's high is the first upmove in a new recovery upleg that is destined to hurdle key "triple top" resistance at 1369.25-1371.50, and which should trigger upside acceleration towards a retest of the Feb high at 1400.00. From an intraday perspective, let's keep an eye on 1351/00, which represents the 50% pullback support area of the rally from yesterday's low to today's high, and which should contain forthcoming weakness if my bullish near-term count is to remain viable. I am not sure what to make of the whipsaw action in the ProShares UltraShort Inverted SPY ETF (AMEX: SDS) since Friday morning's surge that tested the Jan-Feb resistance line at 64.20. However, technically, that test failed! Now we find the price structure probing the vicinity of its opposite number: its Jan-Feb support line, now at 60.60, which must contain any forthcoming weakness to avert a potential downside acceleration (that represents a powerful advance in the major equity market ETFs). If the bears were in the drivers seat last Friday morning, they now find themselves on the defensive. Uninformed odds players are calling a bottom on the stock market citing extreme technical and sentiment related readings. It's too bad they are not history students as well, but that was the boring and unnecessary elective in school most declined to take seriously. These dip buyers are about to learn a very expensive lesson in my opinion, as in terms of market internals and sentiment, we are currently poised for a crash of potentially monumental proportions. Finding religion will have a new meaning for these guys afterwards as their futures become more uncertain, and their appreciation for gold should be raised a notch or two as well as a panic attack shakes some trees. This is when we expect the CBOE Volatility Index (VIX) take out closing basis triple top resistance at 31 on its way to 45, and perhaps beyond. Martin Weiss writes: The U.S. credit markets, the giant growth engine that powers the American economy, are collapsing ... with few credit sectors spared from damage, few investors escaping losses, and little hope of federal action that's quick or strong enough to make a major difference. BULLS FUMBLE - First-Down - BEARS - The near 20% decline from peak to trough in the October 2007 - January 2008 period, marked a potentially devastating turnover for Bulls. After throwing a near interception back in August, Bulls held steady, recovered, then fumbled critically at the October ‘07 highs. Bears handily took possession thereafter, and have scored an undeniable first-down with the lows hit in January. Despite the aid of statist intervention along with surety of more where that came from, the Bullish contingent finds itself in the very rare and awkward position of playing defense. The good news is: The bottom indicators are suggesting there is little risk in the market. Short Term - After a bottom has been made downside volume (DV) dries up pretty quickly. That has not happened yet, but it is encouraging to see DV falling off faster in the small cap indices than the large cap indices. 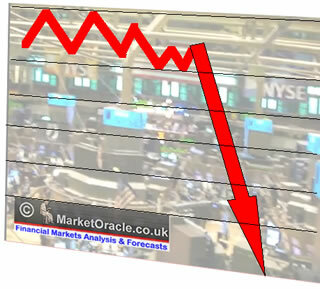 Credit Insurers Must Keep AAA Rating or Else - This week, on Thursday, February 14th , Bernanke spoke, markets fell. Confidence in the Fed Chairman wanes. From a fundamental perspective, until something is done to bail out the credit insurers, so they maintain their AAA rating from Moodys and S&P, market rallies will be corrective. This is an economic nuclear bomb at 32,000 feet. This is about bank solvency, bank risk-based capital, the bank credit function, not about the insurers themselves. Should a downgrade come to the insurers, billions of municipal bonds will effectively become illiquid, joining the trillion of CDOs (mostly subprime loan securities) that have already become illiquid. Without a bailout here, we are headed for a depression. Period. The monthly chart below (courtesy bigcharts.com ) is showing that the Nasdaq needs to bounce up from here to avoid breaking down. Warren Buffet to the Rescue? It was only a few years ago that I use to sit down at this computer on Friday and wonder what I would write about. In today's environment, there is enough to write three e-letters and still leave interesting copy on the editing floor. Today we look at the rather disturbing developments in the municipal bond market, Warren Buffett's offer to "rescue" the tax-exempt insurers, and ponder what the resolution will be. We also look at corporate earnings, and note how they have been downgraded significantly over the last year. There is (or will be) a connection between stock market prices, valuation, the current credit crisis, and the economy. There is a lot of ground to cover.